You know what they say about imitation…it is the best form of flattery! 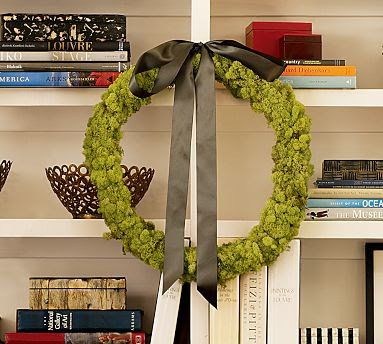 This Pottery Barn wreath is just a wreath form, dollar store moss, and hot glue gun away from being yours on-the-cheap! What was so great about this craft was that I didn’t even have to run to the store. I already had the small wreath form, dollar store moss, and Big Lots chocolate ribbon waiting for me in my craft drawer. It was messy (and I might have said a few four letter words from burning myself with my glue gun,) but it was done in less than an hour. Ta-da! Isn’t it cute? I tacked this baby up on our front dining room window and I love it! It is not shameless – you gave her credit – and I am sure that people will check out her blog because of you – in fact I am off there now! Love the wreath by the way!